The concept of “gun control” much beyond what we have now in the US is a complete myth. Our people have their guns. The Constitution guarantees that right. We ban the nastier weapons, under the police power of the Constitution. We regulate many aspects of sale and ownership, under the same police power. The laws and rules now on the books are close to being the best system ever possible under the Constitution. We need to let go of our crusade against guns and concentrate on generating a crusade against violent people. Guns and cars. Treat liability issues the same. It seems to me a law making gun manufacturers liable for damages for a non-defective product, as some Democrats have proposed, will be a violation of the Constitution. The government cannot pass a law imposing a penalty on one industry unless the penalty applies to other similar industries as well. So which other US industry deals out death and violence at the same or a greater rate than the gun industry? The automobile industry, of course. A motor vehicle is a largely metallic device which in the wrong hands can and does kill at the same or a greater rate than guns, and maims at a much higher rate. I contend that there is essentially no difference other than shape and size between the products produced by the auto industry and by the gun industry. I’m not dissing motor vehicles; they’re as much an embedded part of the American landscape as guns, and both have useful purposes. In two paragraphs, I’m going to show you why anyone who wants greater gun control to stop deaths should in an ideal world also want greater motor vehicle control to stop deaths. For one recent year in the US, the number of motor vehicle deaths was 33,804; for a statistical rate of 10.7 deaths per 100,000. All these deaths are categorized by the CDC as unintentional; though some must have been suicides. So probably 25,000 – 30,000 of these fatalities were due to the presence of unplanned violent circumstances, i.e. drinking or speeding. Further, according to the National Safety Council (NSA), there are each year approximately 2,000,000 injuries not resulting in death from violent motor vehicle crashes. In the same year in the US, all firearm deaths totaled 33,636; for a statistical rate of 10.6 deaths per 100,000. The statistics also show that 64 per cent, or about 21,524 of these gun fatalities are suicides; they are easy to identify. This leaves only 12,112 gun fatalities that were due to the presence of violent circumstances, i.e. murder, robbery, mass killing. Some reports show that each year there are about 75,000 injuries not resulting in death from violent firearm use. I love Barack Obama and have been a bedrock supporter from the beginning. I simply disagree with him on a few things. One of the issues we’ll never agree on is gun control. It’s time for Obama to admit that his “gun control” plan has some flaws, and give it up. Full disclosure, I am a proud member of NRA. This has not stopped me from loving Barack Obama. His speech on Tuesday, January 5, just makes me feel bad for him. Our president has been honestly hurt and dismayed by the national violence. He says his biggest frustration is not being able to do anything about the mass shootings in the United States. This is something that has clearly weighed on him, and a lot of us, over the last years. Of course we’d all like to see a solution, if there was a real solution. Right now there is none. But what about the American soldiers we send off to war? 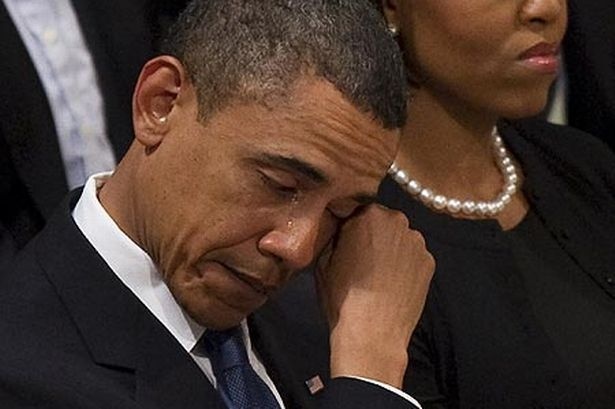 I got the impression that the true source of President Obama’s sadness is that he feels directly responsible for ordering so many young soldiers to be killed in battle in foreign wars. Unfortunately, this is one of the most crushing burdens of being the leader of any country: to deny young men the right to life, liberty and the pursuit of happiness on foreign shores. We all need to let him know he had no choice and has done the right thing for our country. Theoretically, let’s say that a law is passed making gun manufacturers liable for money damages if one of their weapons kills someone in an illegal manner. What would be the obvious result of such a law? All the US gun manufacturers would begin selling only outside the country, and foreign manufacturers would refuse to sell in the US. Then the international gunrunners would come smuggling to fill the demand. Guns would become like cocaine, and it’s likely those gunrunners wouldn’t much care if what they sold was a machine gun or a mortar or a silenced weapon. Those guys just have no business ethics. And this is only one of the crackpot proposals aimed at destroying our Second Amendment rights. England has few guns, you say? England has no Second Amendment. There is your reason why the US has more guns that other countries. The US has no obsession with guns. We do have an obsession with our Constitution; which gives us the overall form of government we all love and care about. In three hundred years the US will still have more guns than any other country. Get used to it, folks.